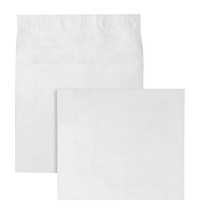 Quality Park Type White Plain Expansion Envelope measures 12 in x 16 in x 4 in and features an open side style with a flap-stik closure. It is perfect for the security of oversized items and is an ideal alternative for costly carton. It is made of heavyweight tyvek that will not rip, tear or puncture and the water resistant envelope is easy to use by simply peeling & sealing. It is more secure than the traditional paper envelope and is sold as 100 per pack.